Anthony Davis Pelicans will take 100 shots per game, who will take the extra shots? Anthony Davis says the Pelicans will take 100 shots per game, who will take the extra shots? During the 2014-2015 season, the New Orleans Pelicans were among the bottom teams in shots taken per game. The Pelicans took around 85 shots per game last season, and it seems like next season will be quite different. Star player Anthony Davis said in an interview that new head coach Alvin Gentry wants the team to take 100+ shots per game. So, with that in mind, who will take those extra shots? Anthony Davis is the obvious choice here. He is the proud owner of the biggest contract in NBA history, courtesy of the five million contract he signed this summer. Last season, Davis averaged 17.6 shots per game. What Gentry wants to do is expand Davis’s range up to the 3-pt line. He also noted that he wants Davis to take more shots on the fly, with an up-tempo playing style. Davis is a beast inside, and he has a nice touch on his jumper. The problem is, defenses were mostly ready and settled for him last season. With an up-tempo style, Davis’s shots can sky rocket up to 20 per game. That is Carmelo Anthony (who is also on of the highest paid NBA players) territory and Kobe Bryant, but Anthony Davis is far more efficient than any of them. For the past two seasons, Gordon is relatively healthy, appearing in 64 and 61 games respectively. His shots are down from his first two seasons with the Pelicans, but that should be expected with Anthony Davis in the lineup. However, with more shots available next season, Gordon could see his 11 shots per game rise up to 14 or 15 per game. The shooting guard is tailor made for an up-tempo offense, where he can catch and shoot from the 3-pt line before there is a defender with a hand in his face. Gordon’s 3-pt percentage rose to 44.8% last season, and 39% the previous season. Holiday is another player that could benefit from the more up-tempo style of play, as the point guard is great in the open floor. He is among the most underrated point guards when it comes to drives to the basket. Few people can drive as hard and as efficient to the basket as Holiday. While he doesn’t have a great jump shot, Holiday can get some extra shots in the fast break. Last year he averaged 13 shots per game, but you can easily see him getting to 15 per game. With the move from the Miami Heat to the New Orleans Pelicans, Cole’s shots rose from 6.5 to 9 per game. With a full training camp with the Pelicans, Cole could potential scratch double digit shots per game. He will be the de facto backup point guard, no matter that Tyreke Evans will have the ball in his hands as well. But Cole can run a ton of pick and roll action with Anthony Davis, something that will produce opportunities for the five year veteran. Since signed by the New Orleans Pelicans in the 2012 NBA Draft Pelicans tickets have risen 74% on the retail market. The retail price on Pelicans tickets during their 2012-2013 season was $51.00 per ticket. The 2015-2016 secondary market ticket price for New Orleans is $89.00 per ticket on average. The New Orleans Pelicans attendance for home games has also risen. In 2012 they ranked 24th in the league with a total of 498,618 attendance for home games. In 2015 their attendance grew to 683,757. A 37.13% rise in attendance. The Thunder were supposed to be fighting for a top spot in the West this season, not fighting for a playoff spot. But they are the team most hit by injuries to key players. Faced with the possibility of missing the playoff for the first time since 2009, the Thunder must soar to one of the last two playoff spots. They are 4 games behind Phoenix and five games behind San Antonio. Another problem for the Thunder is the New Orleans Pelicans, a team above the Thunder in the rankings. The Thunder are ranked 13th in attendance for home games at the Chesapeake Arena averaging 18,203 per game in 2015 which has been constant since 2012/2013. The Thunder has a 12-7 record at home so far. OKC Thunder opening day ticket prices on the secondary market have dropped -36.61% from their high at the start of the 2014/15 season of $142.00 per ticket down to $90.00 per ticket average currently. OKC is struggling on the road with a 7-13 record and averaging 17,018 (89%) in attendance this season which is down -7.18% from their 2013 average of 18,335 per game. OKC Thunder tickets for road games are averaging $67.00 per ticket which is a decrease of -24.71% since the start of the 2014/15 season. The Thunder have the commodity of playing in the same division as the lowly Timberwolves. It is not just this game, but two more by the end of the season the Thunder will play versus Minnesota. And for a team desperate for easy wins, it doesn’t get as easy as playing the Timberwolves four times in the season. View all Thunder vs Timberwolves tickets at the Chesapeake Arena. The Thunder lost the first games of the season versus the Pelicans, but those were with half of the team injured. Now they have Westbrook and Durant back in uniform, which could be enough for the Thunder to win on the road. They will play the Pelicans at home just two nights later, which gives them a great chance to even things out with the team from New Orleans. View all Thunder vs Pelicans tickets at the Smoothie King Center. OKC Thunder tickets for their game against the Pelicans Feb 4th at the Chesapeake Arena start at $37.00 per ticket and are averaging $62.00. Unlike their duels with the Pelicans, the Thunder won two of the duels with the Phoenix Suns. Should they get into the playoffs, they must continue the success versus the Suns, a team that is three games in front of the Thunder in the standings. They will play one more game in Phoenix in April. The first two duels, which the Thunder won, were played in Oklahoma City. View Phoenix Suns vs the OKC Thunder Tickets at the US Airways Center. Same as with the Timberwolves, the Thunder must rack up a couple of easy wins in order to make up ground with the playoff teams. The first duel between the teams was as close as possible, with the Thunder wining 104-103. They will play one more game by the end of March, in Oklahoma. View all Lakers vs Thunder tickets for the Staples Center. You can also purchase OKC Thunder tickets for their meeting with the Lakers at the Chesapeake Energy Center. Before the season started, the Thunder and the Blazers were supposed to battle for the title in the Northwest division. Just half the season in, Portland has the title wrapped up. The Trail Blazers have won two of the first duels between the two teams. For the Thunder, beating Portland has additional confidence value, given the fact they might meet in the playoffs. But they will also have to beat them at least once this season. View all Thunder vs Trail Blazers tickets for the Chesapeake Arena. The Lakers ended their 4-10 November record on a high note with a 129-122 victory over the Toronto Raptors, Kobe Bryant getting his 6,000 assist as well as a triple-double becoming the first NBA player in history to score 30,000 points and 6,000 assists. The December Lakers Schedule will feature two of the best teams in the West as the Thunder and Warriors will be coming to the Staples Center. The Pelicans who are 7-8 won the first time the teams meet, but that was in New Orleans. Anthony Davis is playing on an MVP level this year, leading the league at PER (34 at the moment), and this is his first visit to the Staples Center this year. Davis and the Pelicans will come for a visit again in April. The December game is his chance to shine on one of the brightest stages in the NBA. Lakers vs Pelicans tickets start at $25.00 per ticket. More than half of the experts in the league expected the Kings to be a lottery bound team. However, a month into the season and the Kings are just half a game out of the NBA playoff picture, with a realistic shot to make the playoffs this season. Demarcus Cousins is the second best big man in the league at the moment, trailing only Anthony Davis. Fans at the Staples have a chance to see two of the best big man in the league in a span of just a few days. Lakers vs Kings Tickets start at $26.00 per ticket. By the time the Thunder came into town, Kevin Durant might be healthy. Even if he is not ready to go, hometown Russell Westbrook is healthy, and in his first game back from injury, Westbrook exploded versus the Knicks. The Thunder are one of the most exciting teams to watch, and they have a little history with the Lakers. Someone is going to have a big night, be it Westbrook, Durant or Kobe. Lakers vs Thunder tickets start at $62.00 per ticket. Steph Curry schooled Bryant during a preseason game, and he got a tap on the shoulder from the Black Mamba. This game has the potential to be a high scoring game or a shooting matchup. With the Splash Brothers on one side and Kobe competitiveness on the other, fans are the real winners. Kobe doesn’t forget easily, and he might go directly at the Splash Brothers and challenge them as much as possible. Lakers vs Warriors tickets start at $58.00 per ticket. Another show time team comes into town just before the New Year’s Eve. Phoenix is currently ranked 8th in the West; a spot Lakers hoped to occupy at the start of the season. With a three-guard lineup, the Suns are fun and exciting, and they play at a fast pace. Thanks to Gerald Green, every game provides at least two highlights. Not that the Lakers play slow, they also like to push the pace. And as much as Gerald Green can do, Wesley Johnson can also provide few highlights here and there. Lakers vs Suns tickets start at $47.00 per ticket. Use BTIXDEC15 to get a $15.00 off $150.00 or more on on Lakers tickets marked BV! The Staples Center is located at 1111 S Figueroa St, Los Angeles CA 90015. You can checkout our Lakers Seating Chart if or if you need information about parking at the Staples Center. You can check out the top games and ticket prices for the Lakers January schedule. 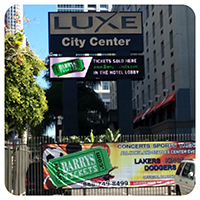 Barry’s Tickets is located Caddy-Corner from the Staples Center! The NBA Las Vegas Summer League, sponsored by Samsung, will kick off on July 11 with 67 games to be played over the 11 day event. All 67 games will be televised live by the NBA Network. The Los Angeles Lakers will participate in the event with their lineup likely featuring whoever they select with the 7th pick in the upcoming NBA draft. Aaron Gordon of Arizona, Indiana’s Noah Vonleh, Kentucky’s Julius Randle and Dante Exum of Australia are potential Lakers targets in the upcoming draft, one of the deepest drafts in years. Other Lakers expected to take part in the summer league are center, Robert Sacre, forward Ryan Kelly and guard Kendall Marshall. The Lakers will kick off summer league play with a matchup versus the Toronto Raptors on July 11th, followed by games with the New Orleans Pelicans and Golden State Warriors. Last season the Raptors featured Jonas Valanciunas, the 2013 Las Vegas Summer League MVP. The Raptors big man’s performance in the summer league was a springboard to a successful 2013-2014 season that included a playoff appearance for the Raptors. The Lakers summer league roster will be announced closer to the event, as will the head coach of the Lakers team. Last season Lakers assistant coach Dan D’Antoni coached the team but is no longer with the organization after taking the head coaching job with Marshall University. The Lakers have yet to announce a replacement for Mike D’Antoni, the younger brother of Dan, who was let go after the Lakers tough 2013-2014 season. Several names have been rumoured in the Lakers coaching decision, but the franchise has purportedly delayed deciding the end of the NBA season when they’ll have a better understanding of the future of Miami Heat star Lebron James. With available cap space, the Lakers can sign Lebron James, although most experts feel James heading to the Lakers is extremely unlikely. Last season the Lakers finished 3-2 in the summer league with Marcus Landry leading the team in scoring. They’ll have a vastly different roster this summer with Robert Sacre likely the only returning player. Following the opening three games, the Lakers will then take part in a tournament to determine the winner. Last season the Golden State Warriors defeated the Phoenix Suns in the title game, 91-77 behind 33 points off the bench from Ian Clark who ended up on the Utah Jazz roster this past season. 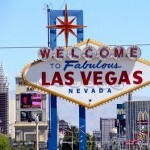 Tickets for the NBA Summer League are on sales now so if you’re looking for a great getaway with some sun, fun and to get your basketball fix then shoot out to Las Vegas to catch some up close basketball at great prices. Usually, you can walk up and get tickets at the door. Chris M.
Two weeks into the 2013-2014 NBA season the Western Conference is taking shape. The usual contenders, San Antonio and Oklahoma City are at the top, but with Denver and the Los Angeles Lakers struggling there’s an opportunity for some new contenders to make a playoff run. Here’s a look at the elite, contenders and pretenders of the early NBA season. The veteran San Antonio Spurs picked up where they left off and are off to a fast start to begin the season. They’re well coached, experienced and deep and should contend for the top record in the NBA all season. If Tim Duncan and Tony Parker can stay healthy, the Spurs are the favourites for a return trip to the finals. The Oklahoma City Thunder welcomed back Russell Westbrook early, and their star point guard seems to be the same explosive player he was before his meniscus tear. The Thunder is 5-1 on the season with their lone loss versus the Minnesota Timberwolves. The presence of Kevin Durant and Russell Westbrook guarantees 55 to 60 wins—how that translates into the postseason is the big question. The Thunder still misses that extra scorer that James Harden once provided. The Los Angeles Clippers are still adjusting to the coaching style of Doc Rivers, but have a deep lineup and bench and an elite point guard in Chris Paul. The Minnesota Timberwolves are finally healthy and displaying the potential that many predicted when Ricky Rubio arrived in the United States. In Rubio, Kevin Love and Nikola Pekovic the Wolves have one of the best trios in basketball and an elite Head Coach in Rick Adelman. The Wolves acquisition of Kevin Martin, who thrived under Adelman in Sacramento, has given the club the strong perimeter shooting two guards they missed. Look for the Wolves to challenge the 50 win mark and reach the playoffs for the first time under Love. Memphis switched Head Coaches, with Dave Joerger taking over for Lionel Hollins. They’ve struggled initially in the transition but still feature the same big and physical lineup that’s worked for them the past three seasons. Marc Gasol is one of the league’s best centers, and he forms perhaps the best center/power forward combination in basketball with Zach Randolph. The Dallas Mavericks, who missed the playoffs last season, have rebuilt to make another run. The newly minted backcourt of Monta Ellis and Jose Calderon is working so far, giving Dirk Nowitzki the guard play he hasn’t had since the Mavs title run. The key for Dallas, like San Antonio, is the health of their veteran players. Over in Houston the Rockets have the potential to be in the elite group but have struggled defensively so far this season. Dwight Howard is showing many of the same inconsistencies he displayed in Los Angeles last season, and he’s not yet providing the interior defensive presence the Rockets desperately need. Houston can score points on anybody; the big question is whether or not they can defend like an NBA title contender. Right now the jury is still out. The Blazers are off to a fast start (5-2), although only one victory is over a legit playoff contender (San Antonio). That being said the Blazers look to be a club that can occupy the playoff position(s) that the Lakers and Denver may be vacating. LaMarcus Aldridge is one of the premier power forwards in the game, while Damian Lillard and Nicolas Batum are consistently improving their game. The Blazers have been efficient, reducing turnovers, and are second in the conference in field goal attempts per game. Their +4.0 scoring margin is good for 5th in the conference. Putting the Lakers in the bubble team category may be a stretch. Their success hinges on how close to .500 they are when Kobe Bryant returns. Los Angeles has improved their overall depth and the youth of their roster, but still lacks the quality depth of most NBA playoff contenders. It’s questionable whether or not Steve Nash has anything left in the tank as he battles persistent injuries. If Nash can’t provide the minutes, the Lakers need they may plummet down the standings. The Pelicans are an exciting club. 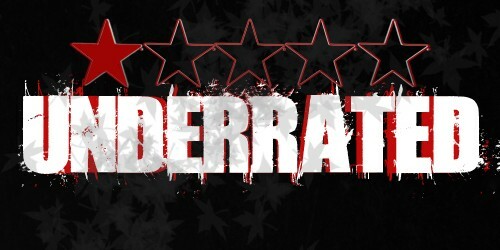 They’ve had some good victories this season as well as some bad performances. They’ve injected some talent into their roster, but it’s still not clear how the backcourt trio of Tyreke Evans, Eric Gordon, Jrue Holliday will co-exist due to their high ball usage rate. Inside though the Pelicans have the emerging Anthony Davis who’s quickly becoming the superstar many predicted. Davis alone could be the difference maker that vaults the Pelicans into playoff contention. The Sacramento Kings have a talented roster that once again looks like a bunch of spare parts. DeMarcus Cousins is one of the most skilled big men in the game, putting together a solid season. His checkered past though makes it hard to rely on him day in and day out. Ben McLemore has excellent potential, but he’s young and finding his place in the NBA. The Kings have nice depth inside and some solid role players, but due to the consistent roster overhaul, it’s been hard for them to find consistency. They’ll be a lottery team again. Denver, a Western Conference power last season is off to a slow start in the post-George Karl era. Losing crucial several roster components, like Andre Iguodala, Corey Brewer and Kosta Koufus have disrupted their rotation. They still have Ty Lawson to lead the team, but the recent injury to JaVale McGee is another blow to their depth. Denver has a significant home court advantage at Pepsi Center that could make them a fringe playoff contender, but it’s hard to see them making much of a run. The Jazz are the NBA’s worst right now. With Paul Millsap and Al Jefferson playing for other teams the Jazz are relying on the young of Derrick Favors, Gordon Hayward and Enes Kanter to provide the bulk of the scoring. The trio has potential but they’re young and overmatched against the rest of the Western Conference. Utah is solidly positioned to get a high lottery pick with the ability to add a significant piece next June.